Materials: New materials and techniques enable clinicians to achieve desired results in fewer steps. No material in the history of dentistry has undergone as much of an evolution as composite resin. The face of restorative dentistry changed forever when successful bonding to dentin was achieved. Since then, the goal of clinical and material science has been to find simple, predictable approaches to the composite restorative process. 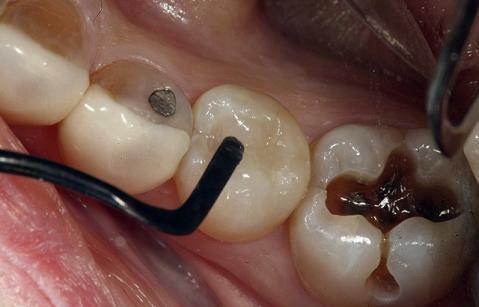 Unlike dental amalgam, the placement of composite requires many more steps and exacting technique to achieve the best results. The process of adhesion, conditioning the tooth surface, application of primers and adhesives, followed by the layering of composite resins to complete the restorative process, involves many independent steps that must be properly executed to ensure good results. This discussion covers some of the latest advances in composite materials and techniques. Successive generations of dentin adhesives have sought to decrease the number of steps for placement without sacrificing clinical results. The seventh-generation, self-etching, dentin-bonding systems have helped to decrease technique and postoperative sensitivity issues while still yielding clinically acceptable restorations. 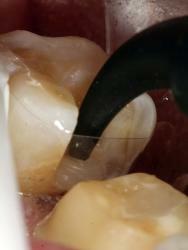 At the same time, it is also true that many clinicians use flowable resins as the first layer of composite resin after the placement of adhesive to ensure precise wetting of the adhesive surface, while creating a layer with less polymerization stress because of a lower modulus of elasticity (< 0.5-mm thickness). A flowable composite material called Vertise™ Flow (Kerr Corporation) combines the adhesive and flowable steps. Brushing this first layer of material vigorously into the tooth surface enhances this penetration into the smear layer and creates a bond that is comparable to that achieved by a majority of the available seventh-generation dentin-bonding agents. Figure 1. After cavity preparation, Vertise was brushed onto all prepared surfaces – both enamel and dentin – for about 20 seconds. The self-etching component in Vertise interacts with the tooth substrate, causing a chemical and micromechanical bond. The initial application of Vertise should be no more than 0.5 mm thick. Several more highly filled flowable composites have entered the marketplace, providing dentists with a convenient way to restore conservative Class 1, Class 2, Class 3, Class 4, and Class 5 cavities. Materials such as G-ænial™ Universal Flo (GC America, Inc.) and Grandio®SO (VOCO America) are examples of products that are designed with the physical properties and polish retention capabilities of most nano-microhybrid materials designed to withstand the occlusal forces generated in the posterior areas of the mouth. A class of newer flowable composites (eg, SureFil® SDR® flow Posterior Bulk Fill Flowable Base, DENTSPLY Caulk; X-tra Base, VOCO America; Venus® Bulk Flow, Heraeus; HyperFil DC™, Parkell, Inc.) is indicated for use as a bulk-fill base (dentin replacement) beneath posterior composite restorations and can be bulk filled in layers up to 4 mm in depth. Being able to place that amount of material in a single increment is a significant time saver, and while the concept sounds quite simple, there are several important requirements a material must meet for this particular indication. According to the manufacturers, these include: increased depth of cure; a viscosity that will readily adapt to the internal walls of the cavity without the need for manipulation of the material; and low polymerization shrinkage stress. Figure 2. This is a view of a preparation filled with Surefil SDR, a bulk-fill flowable composite (up to 4 mm) that has very low polymerization stress. This allows for bulk dentin replacement in high C-factor preparations without overstressing the composite-adhesive interface. Compule delivery also seems to have fewer problems with incorporated air when compared to syringe type of delivery. Figure 3. 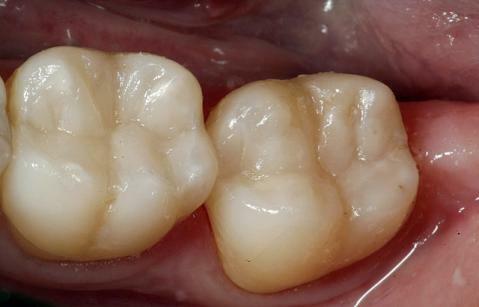 The completed restorations (Esthet-X® HD, DENTSPLY). SonicFill™ (Kerr Corporation) consists of a proprietary composite resin and a sonic handpiece that fits onto a traditional high-speed handpiece coupler. The sonic energy generated by the handpiece causes a dramatic change in the viscosity of the composite resin, so that during placement, it behaves like a flowable liner in its ability to adapt to the internal surfaces of the cavity preparation. Although the restorative material is approximately 86% filled by weight, special additives in the composite allow the filler particles to slide very readily over one another when activated by the sonic energy in the handpiece. It can fill all the intricate line angles and point angles of the most complex posterior cavity preparation in a very precise and uniform fashion. Once the sonic energy is removed, the composite resin gradually returns to a higher viscosity, which is suitable for sculpting the restoration to its most precise morphologic form. The material is then light-cured and finished using traditional techniques. Another unique property of SonicFill is that it has a polymerization shrinkage of about 1.6% and can be bulk filled to a depth of 5 mm while still having a greater than 97% full cure at its deepest point. Unlike other bulk-fill flowable materials on the market, SonicFill does not require a separate nano-microhybrid layer as the last occlusal increment. Some manufacturers have developed “conventional type delivery” for bulk-filled composite materials (eg, Tetric EvoCeram® Bulk Fill, Ivoclar Vivadent; X-tra Fil, VOCO America). 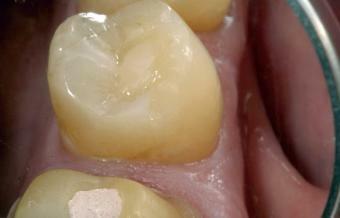 These materials are placed in up to 4-mm increments and can cure to that depth. The composition of these materials has been altered in various ways to allow for increased depth of cure while having less shrinkage and shrinkage stress than previous generations of composite materials. Some of the ways these changes in the behavior of composite resins been accomplished include increased amounts of or different photoinitiators to allow for increased curing depth and newer types of monomers and elastic fillers that minimize the shrinkage when the material is polymerized. Marginal breakdown and recurrent decay has always been the process by which most dental restorations ultimately fail. 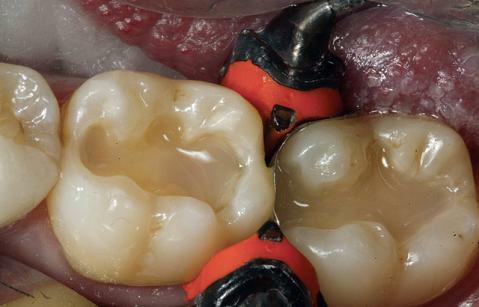 One of the challenges for long-term success of a dental restorative is to find a mechanism by which these materials can slow down or prevent this process. Glass-ionomer materials are known for their release of fluoride ions and their ability to help remineralize demineralized tooth structure. The limitation of the fluoride release has always been the solubility of the material in the oral environment, which means there is only a limited amount of time during which this protection can be available. Giomer products are characterized by their surface pre-reacted glass (S-PRG) filler. S-PRG fillers have a glass core that is pre-reacted with a polyacrylic-acid solution. The glass-ionomer phase in Giomer fillers are protected from water sorption and material degradation by a surface-modified layer. As a result, the ion exchange from a composite material that incorporates this technology has the ability to help neutralize acids caused by bacterial metabolism, which are the direct cause of tooth demineralization and decay for extended periods of time. Two such composites on the market that incorporate Giomer technology are Beautifil® II and Beautifil® Flow Plus Zero Flow and Low Flow (Shofu Dental corporation). Using yet another approach, dental resin polymer chemists have explored substituting the existing composite chemistries to find an improved resin monomer system. Researchers at the University of Colorado have developed a unique monomer chemistry based on dimer acid monomers that significantly reduces polymerization shrinkage and shrinkage stresses and also increases the initial double-bond concentration of the monomer and degree of double-bond conversion achieved during polymerization. This increased conversion rate can lead to better physical properties (ie, wear resistance) in the polymerized resin. The changes in this material were accomplished by synthesizing a unique diluent monomer based on a soy-derived dimer acid chemistry, which was radically different from conventional diluents used in conjunction with typical Bis-GMA resin systems. The end result was a new low-shrinkage, high monomer conversion nano-hybrid composite resin (N’Durance® Universal Composite, Septodont). The volumetric shrinkage of Bis-GMA-based nano-hybrid composites ranges between 1.85% and 3%, while the dimer acid chemistry has reported polymerization shrinkage of 1.27%. With this significantly lower volumetric shrinkage and a nonstick formulation, optimal adaption to the cavity preparation is readily achieved. It is important to mention that the same dimer acid high-conversion chemistry is used for the N’Durance® Dimer Flow flowable composite resin as well. Trying to recreate nature’s blueprint with man-made materials is no simple task. Yet advances are being made to allow dentists to create excellent esthetic tooth replacements using direct tooth-colored restorative materials that can offer the patient an optimal, long-lasting result.